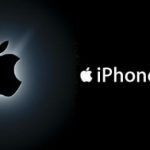 The iPhone by Apple is the smartphone which revolutionized mobile phones. It introduced and made touch interfaces the norm among smartphones, and smartphones the norm among mobile phones. Every time one pulls out an iPhone among crowds, it’s greeted with oohs and aahs from the people. The already extended functionality of this device was extended by the introduction of the App Store on the phone. The 650 thousand plus apps enhance the functionality, design and also bring a whole load of features to the table. You can find an app for just about anything these days. This is why we have carefully selected for you some of the best apps of the lot from various different categories and listed them in a single place with table of contents for quick jumping around. We’ll appreciate your experience while using those apps which you can share using the comment form below. Home and personal safety is paramount these days and many people are now making the most of modern technology to keep themselves and their property safe. Here are 5 of the best home and personal safety iPhone apps! If you are someone who regularly travels or works on your own then this app is for you. You can pre-set a number of emergency contacts and the app will alert them if you phone has not been used for a set length of time. If you are out of contact longer than the time you have pre-set then your family will be alerted and know that there is a problem. They will also be sent details of your exact GPS position so that they can find you as quickly as possible. This CCTV app allows you to keep a watchful eye on the physical security of your home whilst you are out and about using your iPad or iPhone. It simply links up to your CCTV and provides real time streaming from your cameras. You can also move your cameras to follow any activity by using you iPad or iPhone as a remote control. If there are any suspicious movements whilst you are out then you will receive an email to let you know about it. You can also manage multiple cameras all on one screen and take screen shots as and when you need to. 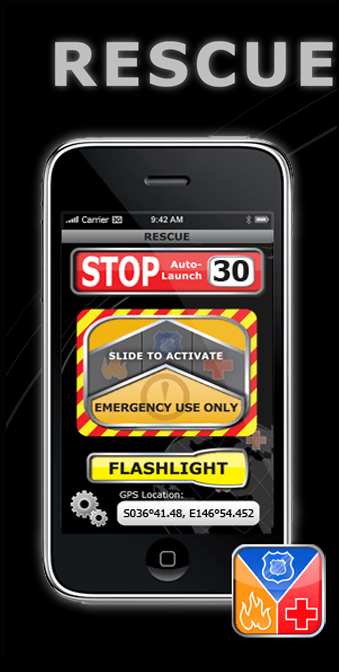 The rescue app is a nifty personal safety app that has been given the thumbs up from medial and fire service professionals everywhere. You can use the app to contact the emergency services if you find yourself in danger, send messages to selected contacts with your GPS position listed and activate a high pitched alarm to frighten off attackers or to help rescuers find you. It has been developed with easy operational controls so that it is ideal in emergencies and it also has a built in flash light. 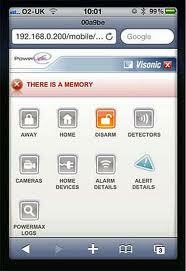 Visionic is a safety and security app that not only allows you to control your home security system but your utilities too. You can use it to control your lights, heating, curtains and gas as well as your CCTV and alarm system. Additional features include a Carbon monoxide monitor, heat sensor and a medical alert feature. As with the Domus app it also alerts you when any suspicious activity is detected be that a break in or one of the kids having an unauthorized party whilst you’re away! Sometime you can find yourself in the middle of a situation before you know it. You may not be the victim but you might have seen something that could later help the police. The iWitness app allows you to instantaneously make video and audio recordings or your current surroundings. It also tracks your GPS position for further accuracy in case of emergency. This app is also great if you are lost and do not know where you are. The GPS locator can be used alongside a recording in which you describe your current location. Guard My Angel is that personal safety app which gives you peace of mind while in shady places or emergency situations. It is a free app but doesn’t compromise your privacy. Whenever you feel unsafe in any place and might want to let your pre-selected contacts know about your whereabouts in case of an emergency, just set the timer and hit the “Watch over me!” button. The countdown can be stopped anytime by just pressing the “I’m OK” button. If the countdown reaches zero before you press the “I’m OK” button, alerts via SMS, emails, Facebook notification, etc are sent to your selected contacts, signalling an emergency situation where the user needs help. The contacts are notified the user’s exact location on a continuously updating Google map. Consider a situation when you never felt you would need to notify your contacts about your safety but still something happened, there is the “SOS” button. Just hit that anytime and your contacts will be notified immediately. 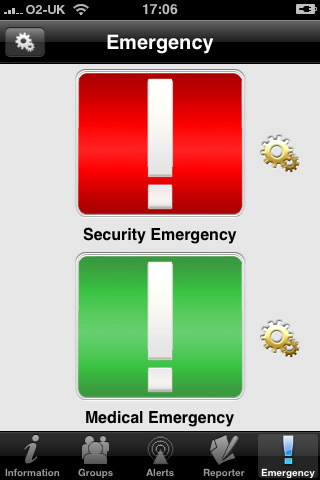 The application also monitors the forces on the phone and send an alert as soon as it detects forces that are strong enough like in a car accident. Note: Crash forces detection is currently available on the Android version only. Bloggers of the world unite: the population has gone mobile and thanks to a number of apps for the iPhone you can get your blog on whether you’re at home, on the road (although hopefully not driving), or sitting in a trendy coffee shop of your choosing. Here are just a few of the best iPhone apps to help you navigate the ins and outs of the blogosphere. One of the most popular blogging sites on the web has now become even more widespread thanks to their free iPhone app that lets users manage their blogs on the go, including posting (or editing posts), adding images or videos, and moderating comments. You can’t do everything that you do on your computer, but it’s certainly handy if you like to monitor comments and update your blog frequently. While you might not see the immediate value of this app in terms of blogging, it can be quite useful (and it’s free). The main function allows you to ask community questions and get answers, so if you want to do random surveys for posts or you simply can’t find some info online, perhaps you could get what you need here. Of course, you can also share links back to your blog. The implications for blogging here are pretty obvious, which is why this freebie gets a spot on the must-have list. Step one: download app. Step two: get followers. Step three: tweet links to new blog posts. ‘Nuff said’. If you’re managing multiple blogs on the go, this is a great tool at no cost. You can toggle between blogs, upload posts, save drafts, and add pics, labels, and location info (amongst other things). This neat app will cost you 99 cents, but it’s worth every penny. It’s like a community brainstorm (or a collective muse) that can help you come up with new ideas to keep your blog fresh, even when you feel tapped out. You can also post blogs for feedback. At $4.99, Blogsy may strike you as a bit pricy, but those serious about blogging will love the features it includes, especially the drag-and-drop functions that allow you to add pics, links, and videos to your blog posts at the swipe of a finger. And the comprehensive approach to blogging lets you schedule posts, write and edit in HTML, add tags, and edit specs (sizing, etc. ), amongst other things. In short, it’s a mobile blogger’s best friend. Yet another free app, this one allows for posting across multiple platforms and is compatible with all the big names like WordPress, Blogspot, Tumblr, and more, and even some of the smaller ones. You can not only write, edit, finesse, and post blogs; you can also manage multiple blogs (and post to all simultaneously). And the auto upload feature allows you to access the internet and integrate pics and links as you go. The only caveat: this app is ad-funded, so you get it free but you deal with the ads. For the avid blogger, there’s nothing better than the ability to access and manage blogs from anywhere, and the many apps for the iPhone aimed at blogging can help you on this score. Just keep in mind that you may be using your iPhone quite a bit more once you download these handy apps, so you may want to up your data package (since prepaid phone cards obviously won’t do the trick). There are lots of great music apps for the iPhone and other Apple devices. Head to the App Store and you will find apps that allow you to simulate playing guitars, flutes, drum kits and other more exotic instruments. Whether you are looking for virtual instruments, musical themed games, beat boxes or DJ controllers you are sure to find something that fits the bill. 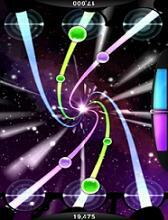 Tap Tap Revenge is similar to the popular Wii and Playstation game Guitar Hero. 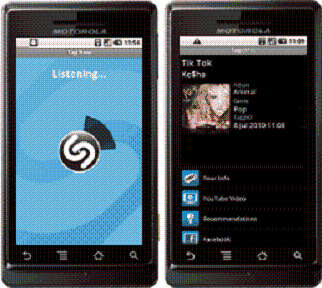 There are a number of preloaded songs that are included with this free app but you can also upload your own tracks. A series of bubbles will fly across the screen and your job is to tap the bubbles at the correct time. There is an online mode with this game which means that you can challenge other players to a rock star style dual and see who has the quickest fingers. The controls are really easy to master and you will soon become addicted to this fabulous little game! This is a high-end beat making app that puts a world of musical opportunities at your fingertips. There is a wide selection of drum sounds for you to choose from and you can either use them as they are or edit their properties for a more custom sound. Additional alterations that can be made are to the pitch and the tune of certain beats and rhythms. There are also some great effects that can be overlaid on to your completed beat. When you are finished you can upload it on to your computer and use it in your songs or homemade videos. 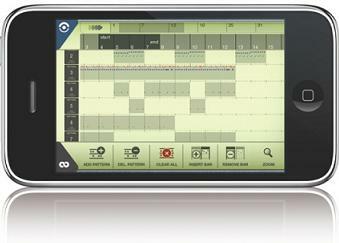 This app could be considered as a serious piece of DJ equipment due to its functionality. Have you ever heard a song playing whilst you were walking down the street or sat in café and wondered who the artist was? If so then this clever iPhone app is for you. Next time you’re bobbing along to an unknown tune simply grab your iPhone and open up this app. Point your phone towards the music and watch as it pricks up its ears to analyse what it hears. It has a song library of over 6 million songs and its accuracy is amazing, even in noisy environments such as clubs and colleges it will give you accurate information. Not only will you be told the name of the artist but also the song title and album name. 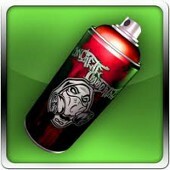 Get in some spray painting practise on your iPhone or iPad with a range of super cool spray painting apps. Spray painting has become a widely accepted art form and one that frequently pushes the boundaries of popular culture and art. There are a number of spray painting apps that turn your iPhone or iPad screen in to a graffiti wall for you to draw all over. Whether you are a serious graffiti artist or just someone who wants to have a bit of a scribble you are sure to enjoy these spray paint apps. With this app you can start with either a blank canvas or choose from one of the pre-programmed walls such as brick, cement, white paint etc. You could even upload a photo to scribble over. There are 29 colours available and you simply use your finger to paint. This app is quite light-hearted and even allows you to decorate your graffiti art work with ‘ornaments’ such as birds, hats and other signs and symbols. This app is extremely popular and has been downloaded over 5 million times! There are now a number of new artist packs which include tools from spray painting legends PHETUS and COPE2. There is a hand written font tool, signature stencil tool and a number of HD backgrounds to choose from. This is as well as the original shake, rattle and spray sound effects, massive colour wheel and range of brushes and spray cap sizes. 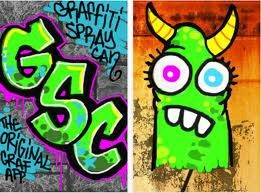 Once you have finished your graffiti art you can then share it with the Graffiti Spray Can community. 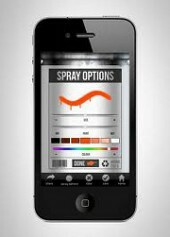 This is an app for those who are serious about spray painting! This app by Daniel Cota allows you to spray on to any image or background with a realistic finish. Whether you want to import photos from Facebook or take pictures on your camera, this app has the functionality to turn almost anything in to a graffiti wall. One feature that this app boasts that many others don’t is a colour mixing palette. This allows you to create an endless range of colours for your artwork. There is also a colour picker tool which allows you to select and match colours from other pictures to use on your work. Overall this is a nifty little app that has a lot of functionality and is backed up by a strong Facebook community who regularly share their creations. The Street Tag app allows you to virtually graffiti any wall in your surrounding area. You simply take a picture of the wall or building that you want to tag and then spray away on your iPhone screen using your finger. Options include spray colour, size and wetness. Once you have finished your artwork you can then geo-tag it so that other app users can view your tags. A virtual map will show all of the buildings in the surrounding area that have been virtually sprayed and you can view other user’s artwork as well as your own. 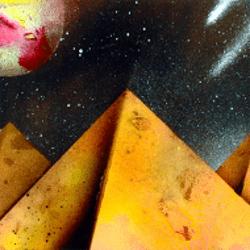 This app by Em­ineo Design provides everything you need to know about spray paint art. Whether you want to view pictures and download them as wallpapers or watch videos and learn the techniques to do it yourself, this app provides a variety of functions. There is also an uploader that allows you to snap a picture of your painting and send it to the app for everyone to see! With features including paintings, videos, how to instructions, tools, shading techniques, and an informative history of spray paint art, you will be amazed by the paintings that can be accomplished with just spray paint. Overall, this is a very useful app if you have any interest or desire in art. There are actually several Apple apps specifically for those looking to create and keep their New Year’s Resolutions in 2012 (in fact, two are even named “Resolutions 2012”, one from 2Morrow Mobile and the other from Mobilevel, although only the former received decent user reviews). However, you don’t have to be quite so literal when looking for the best apps to help you find the motivation to stick to your New Year’s resolutions (for real, this year). Whether you’re trying to lose weight, you want to make an effort to stay connected with family and friends, or your goal is to finally leave nicotine by the wayside, here are a few of the very best apps for your favorite iDevice that will help you to succeed. 2Morrow Mobile has created a user-friendly app (for just under a buck) that will help you to identify your top goals and find ways to reach them through a plan of action. If your main problem, like most people, is an “easier said than done” attitude, then this app can definitely help. It provides you with a template to set goals, identify barriers, pinpoint changes you need to make in your behavior, and track your successes. In short, it gives you the tools you need to stay motivated. For anyone looking to lose weight and get fit in 2012, having this phenom of a personal trainer at your fingertips could just be the key. The free version comes with 30 slimming recipes, 30 fat-burning workouts, and tips, messages, and podcasts from Jillian. But if you upgrade to the paid version ($3.99 a week) you can get a lot more, including a customized fitness and meal plan (plus more than 500 recipes), membership to JillianMichaels.com (and all the extras that provides), and access to the message board to chat with other members. Perhaps you want 2012 to be the year you make that special love connection, and this is the app that will take you there. There is a free version available, but for $4.99, the paid version lets you add more friends (up to twenty a day), see how you were matched up with certain people (by viewing their answers to questionnaires), customize your friend list, and more. It’s a one-time fee (unlike other dating apps) that gives you a lot more options to get your date on, and users have called it the best dating app for the iPhone. The service for your Apple devices is just as free as the computer version, and just as handy a tool for keeping in touch with loved ones. Free video calls on your Wi-Fi network mean that you never again have to worry about minutes or roaming charges. So whether you travel frequently, you’re restricted by a work or government phone, or you simply like to catch up over your morning cup of coffee, this app will get you connected fast and free. This free and easy app gets better user reviews than many of its costly competitors, and it’s probably because it’s so simple. It gives you a cigarette budget for the day (complete with weekly reduction goals), provides reminder alerts for tracking, charts your progress, and offers motivational tips and facts to keep you going. Quitting isn’t easy, but if you want 2012 to be the year you take your health in hand, giving up this crutch is a must. 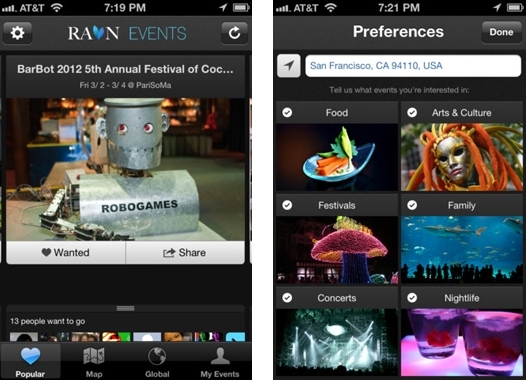 If your social life is of particular importance to you, and you don’t want to miss out on any upcoming activities near where you live, then the RAVN app for the iPhone will be ideal for you. Not only does this app notify you of any events which due to happen in your area – via a slideshow – it also allows you to gradually tailor the events that you are notified about to those that you are most likely to be interested in. You do this by saving any events that you receive updates about onto your wish list, which is saved to the memory of the app and helps it to target you with particular events that are most likely to appeal to you – in the same way that a wish list with Amazon does. It seems too good to be true but now you can really just point your camera at a foreign language and see the translated picture on your iPhone. You should have at least a clear, head-on shot of the foreign language text, preferably cropped so that the app knows what exactly it is supposed to work on. The actual character recognition and translation occur in a remote server so you’ll be needing an active Internet connection which sadly not all travelers, for whom this app is essentially made for, have. The app also doesn’t work with anything handwritten or from any 3D perspective. The test results have generally been successful but multiple shots hade to be taken sometimes to get the focus sharp enough. However, Photo Translator is a fantastic app with wide ranging possibilities. Best Apps for iPhone is unique one, and this article too. Great. I was searching related to iPhone and landed here. Anyhow, thanks. For personal safety app I&apos;d also suggest you look into Guard My Angel. Added the App description and YouTube Video. Wow lots of app. Thanks. Its really a great apps collection, I loved the apps. I think you can’t expect a better app from your home security. Great post bro.. and superb applications. iPhone users can try Siri application also that is also a nice app. 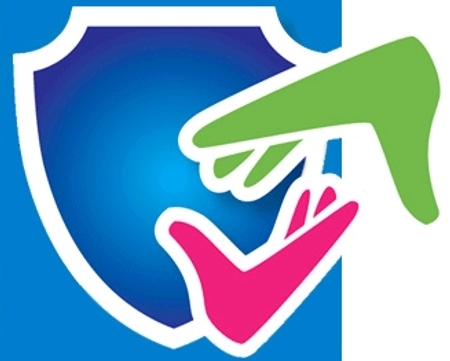 Guard My Angel is now the 1st personal safety app that was adapted to visually impaired – way to go!!! Dropbox is the best app I have on my iPhone! I absolutely love it! This one can save you a lot of time and money when it comes to file sharing. Yeah Dropbox is very useful to share the files and backup an important files. All these iPhone applications are very attractive to me. It would be very useful for all users, but I doubt if they are available free for download. Wow this is huge list of great apps, i dont know many of them so i am gonna try them all. Really enjoyed the article. In my opinion Shazam is one of the greatest apps ever created. You covered all most all type of apps in this article. I love the list. I have been using Blogsy for 2 years, If you would emphasis some of it’s strength , I could appreciate you. 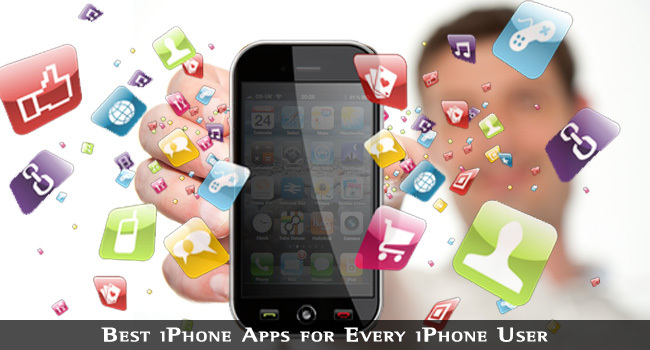 iPhone is a addiction, If you are addicted of it than you can’t live without it.iPhone apps are much better than android apps.Though all apps are not free but they are worth for money.Thanks for sharing useful apps…. Thanks! This is helpful information. I was searching on universal cctv iPhone app and it looks like there is no any unviversal app. each dvr manufacturer make their ovn standarts for each app. But thanks now I will try these you reviewed. i like these apps as their extensible is just awesome. i used to blogging apps and they are just awesome and reduce my work almost half. Nice article by author. I have used some of the app which is listed in your article, rest of the app i will install soon. love ios app. This is pretty huge collection of apps. I will certainly going to try them out. Thankyou for putting time to compile the list. All these apps are quite useful, but they do not pertain to the iPhone 4s exclusively. Infact, there is not any feature in them which favours the increased specs of the iPhone 4s. This is the problem with Technology these days. The Developers beef up the hardware, but the software never follows suite. Great collection of list. Would be a more helpful for the iPhone users. The most controversial question about iPhone apps are not available for free as android apps. But I would say the iPhone are worth for the money. I use iPhone 5. TO be frank, you are still missing many of the best apps from categories like productivity, music, and much more. Can you please suggest some good apps? Thanks in advance. Nowadays Box is so popular in cloud data storage apps. Please add in your list. Anyway Great collection. I use iPhone only for social media and phone functionality. And sometimes use wordpress for blogging. Dropbox also very useful. I use it for over 6 years. That was really a pretty good list of apps bro, but its old list, I guess you need to update this list now, I can understand that it takes lot of effort to make such list :) Thank you. Thanks for sharing that. That’s really gonna help me. I also have iPhone and I was just looking for best apps for it. Great selection of apps, thanks :) I am already using some apps from the blogging section. I blog a lot and I like how these apps help you to be more productive. Now I have to try other apps. Great list of apps here, just got my new iphone 6 so will most probably download a few of the ones mentioned here. Byline is a good Rss reader apps for iphone and ipad. It supports offline reading. The Skype app is awesome and I use it almost daily. 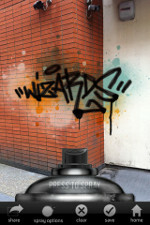 That graffiti app looks seriously great and I should try it this weekend. Personally I have really been enjoying the Casts app. Of course, I am a podcast junkie. Great list Rajesh. I have installed spray paint app. Also, work great. I’m already using skype and WordPress app on my iPhone 5s and they work like a butter. Though I had installed few game app which made by ios run slower but after removing it. My phone works great. Pretty good collection of security and tracking apps. I am a regular iPhone user and always have one tracking app on the phone. Thanks for sharing this apps Rajesh! This is very informative post you’ve provided. This is definitely helpful post for all iPhone users. Will try out couple of them I liked. Thanks. Great article and list of apps. I have used a couple of them and still using them. Especially, Innovation and Formspring have helped me a lot to get the ideas for blogging and interacting with like minded people. I will also try BlogBooster and blogs in the future for blogging purpose. I didn’t know about them earlier. Thanks for sharing. Such a big list of apps to choose from. Now I don’t need to surf internet for best iPhone apps, I already bookmarked this page. Thanks for sharing.